Fumaria is another genus in which is difficult to distinguish one species from another, so if I have identified this incorrectly, please don't hesitate to let me know. 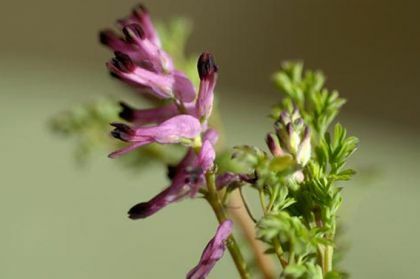 Common Ramping Fumitory is an annual frequently found on arable land, and is also seen – by some - as a common garden weed. 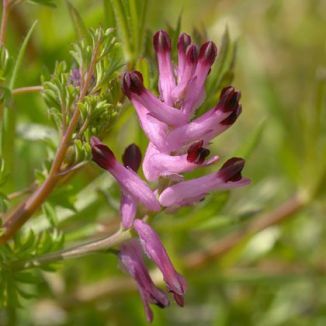 It has tubular pink flowers which have their upper petals compressed and the lower petal with almost parallel sides which are slightly turned up. These flowers (9-11mm long) are pink with deep purple tips and bloom from April to October. The leaves are floppy, straggly and weak and are pinnately divided and feathery. This is not a native plant and it belongs to the family Papaveraceae. My first record of this plant is in Ballitore, Co Kildare in 1977 and it was photographed in Gibletstown, Co Wexford in 2006.